This fun, bright 1 inch St Patrick's Day badge is a must for anyone celebrating this year. Why not add some fun Irish themed badges to your outfit. 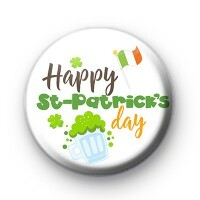 This badge has the message Happy St Patrick's Day written in a bold font along with the Irish Flag and a pint of green beer.